On Monday the 27th November 2017 the girls’ football teams went to Hanney School to take part in the Wantage Area 6 a side Football Competition. We entered two teams into the competition. 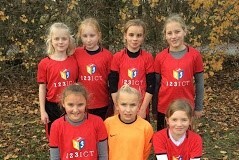 The B team were made up of students mainly from Year 4 and 5 with Georgie in goal. This was the first time the girls played together as a team. The first two matches were both 0-0 draws against Millbrook and St James. In their third match against Charlton A they unfortunately lost 2-0. The girls all defended brilliantly and Georgie made some amazing saves in this match. The A team played their matches and won all three against St Nics, Stanford and Charlton B. Both teams played in the quarter finals Wantage A played St Nics and Wantage B played Stanford. Both teams won their games and secured a place in the semi-finals. In the semi-finals Wantage B played Charlton A again, and Wantage A played Millbrook. Wantage A won their match, however Wanatge B lost meaning they finished in a very respectful 4th place. In the final Wantage A finally had to play Charlton A, we knew that this would be a very close match. In wind and rain the girls took to the pitch. At full time the score was still 0-0, they had to continue for another 2 minutes. The whistle blew and the score was still 0-0, penalties were to decide the eventual winners. Ruby saved Charltons first penalty and Rachel scored our first goal! The second penalty was taken by Lucy, but she missed, Charlton scored, again it was a draw. On the final penalty Rubie scored for us and then went on to save Charlton’s goal. Wantage A had won the competition!